The SpiritHouse Project :: About Samuel Younge Jr.
Samuel Younge, Jr. was born in Tuskegee, Alabama, on November 17, 1944. After leaving the Navy, he entered Tuskegee Institute where he became an active organizer and student leader in the Southern Freedom Movement. He played a leading part in galvanizing and organizing the student body at Tuskegee Institute. Alongside Gwendolyn Patton, president of the student body, and others, he helped organize a Tuskegee student march to Montgomery, Alabama in response to Bloody Sunday and the virulent terrorism and injustice in Alabama and throughout the South. Samuel also worked in Mississippi, Lowndes County, and Macon, Alabama. In the winter of 1966, Younge was working as a vote registration volunteer at the Macon County courthouse. On January 3rd, Younge stopped at a service station to buy some cigarettes and to use the restroom. Marvin Segrest refused to allow Samuel to do so. Instead, he shot him in cold blood. 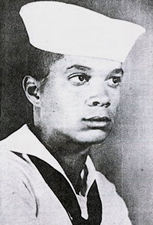 Younge was the fifth civil rights worker who had been killed in Alabama in 12 months. After a protest march organized by students at the Tuskegee Institute, Segrest was arrested and charged with murder. At the end of his trial, an all-white jury found Segrest not guilty of murder.